Bing gets five stars for aesthetics, in my opinion. The photos rotated daily on Bing.com are always beautiful and intriguing, though I generally search using the Bing search engine box on my navigation toolbar. Once inside the search results, the beautiful layouts and graphics show that Microsoft has put some serious money into design. The interface is full of value-adds. The left-hand column of links was a little hard to get used to, because my Google-trained eyes are accustomed to looking far left for the results. But the links Bing provides there let me see related searches (without scrolling beneath the fold) and my recent search queries, which I’m finding useful. Blended search on Bing could be better. I ran a search for [birds of southern california] and the first page of results contained 10 Web listings and a row of six image results (see above). That was a few days ago. Strangely enough, today the same search displays a row of video results instead of the images! Note that Google provides a row of six image results midway down the page and three book results at the bottom for the same query. I do prefer Google’s way of interweaving the blended results into the Web listings so I can see images, videos, etc. without scrolling. Ahh, here’s the rub. While Bing often provides the results I am looking for, I have to sort through some junk to find them. Here are a few specifics. Titles – Similarly, Bing’s choice of title text sometimes differs from Google’s. Google recently revealed that they sometimes change the title shown in a SERP listing and don’t display the page’s actual Title tag when the search engine feels some other text is more appropriate. Here’s proof that Bing does this, too. Top 10 Results – Bing’s choice of Web results for the front SERP was about 90 percent satisfactory. Half of Bing’s top 10 results were also on Google’s first page for my search query. Only one of Bing’s top 10 Web search results was completely off-topic: a grisly news story about a family found dead in “Southern California”. (Shudder.) So other than the less-than-helpful wording choices for some of the titles and descriptions, Bing’s results gave me the Web sites I needed. These irrelevant images may have matched the “southern california” part of the query, but Bing really missed the sense of the query as a whole. They just were not relevant. 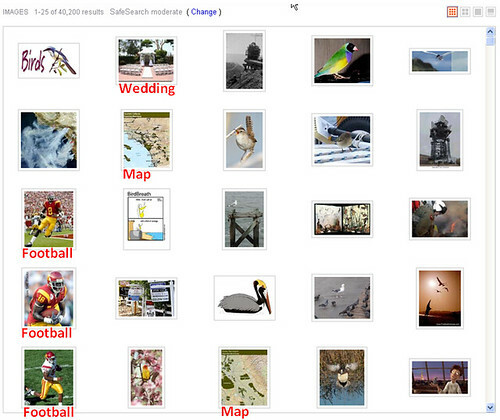 On the positive side, Bing’s image search has some time-saving interface features. Images initially show on a clean canvas, without text captions. Zoom icons in the upper right let you click to redisplay the image thumbnails in three different sizes, or with the text turned on. 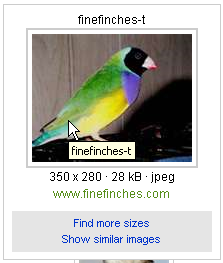 Hovering over any image enlarges the picture and gives you the file name, size info and Web site. In the final analysis, a search engine is about helping you find things you’re looking for, and Bing still has a ways to go here. 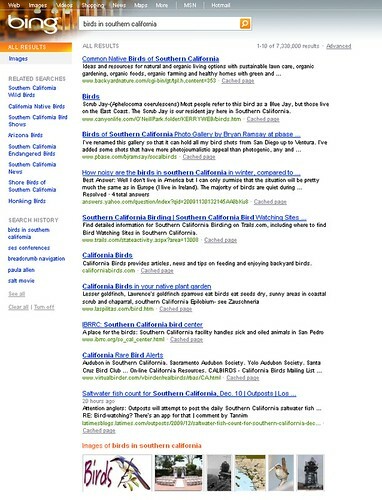 Granted, I’m using a research-oriented query with [birds of southern california]. Could Bing call itself a “decision engine” because it’s really only geared for helping consumers choose a product or service? That cannot be true. Since people usually begin their decision-making process by learning about a subject, Bing must also handle research queries or lose that future decision maker early in the game. So Bing, I’m counting on you to continue to refine your algorithm and bring relevance up to the level people expect. Down deep, I switched search engines because I know that Google must have competition to stay healthy. Competing search engines protect the search industry, protect the public, and ultimately, protect Google from itself (“absolute power corrupts absolutely”). By using Bing I can be one user, one miniscule but nonetheless real support for search independence and privacy. I have been on the fence, switching between the two since the launch of Bing… but today, the last straw – I got an email back from Google Maps telling me that they cannot do anything about the fact that my street address is spelled wrong. I sent the correction to them 2 months ago, and they just replied to me with a terse email saying “there is nothing we can do do correct the error you reported”. Really? You had my street name spelled right for, like 4 years, and suddenly it is spelled wrong and you cant fix it? What the??? This means delivery people cant google map me, I cant use my address as the default ‘starting point’ for directions, etc. Real pain.. I’m done with google and using Bing now, not just for maps but my default search engine…. Thanks Paula, people really do underestimate Bing. Google gets its hooks into people and does not let go. Bing however are constantly improving on what is already a great engine. I imagine that the market share will be different in 2 years time. I like using Bing every now and then. But most of the time I’m looking for targeted relevancy to what I’m searching for, so Google is the way to go on that. I do like a few things about Bing, their design is better in my opinion and the info pop up about the url does a lot when searching, you get to know what you are about to click on a lot better than Google title and description. I look forward to reading my post by you Paul, keep up the great content. Matthew – Your excellent comment made me stop and think, but there’s more to this than just one company against another. Competition is needed among search engines in particular. Microsoft may be a larger company for now, but its market dominance in the desktop realm has not successfully transferred into search. They are still trying to compete in that arena. I don’t want Google or anyone to be the only game in town. I don’t think that we can say with confidence that “Google is only keeping data that would be relevant to a search engine.” Google has all of the data – e-mail contacts and messages, site analytics, photo uploads, feedreader information, mobile data, as well as your search patterns and queries. One has only to recall AOL’s 2006 leak of hundreds of thousands of users’ search queries with personal information to realize that the potential exists for misuse. I’m not accusing Google of misusing it yet, or even of planning to. However, the way they slipped in the expansion of personalization smacked to me of Big Brother tactics, and it made me uncomfortable enough to do something about it. There’s always a tradeoff between convenience and security. Personalization may make it easier and faster to find what you’re looking for, but at what risk? It’s like locking your front door. Bringing in an armload of groceries would sure be faster and easier if I didn’t have to struggle with a key, but that doesn’t mean I’ll leave the door unlocked. Security is worth a bit of inconvenience. I don’t understand. It seems to me that you like Google more than Bing, but you’re choosing to use Bing anyway. Because Google is personalizing all searches. I honestly don’t see the harm in that. So what. Google is only keeping data that would be relevant to a search engine anyway. I don’t care if Google knows what I search for, and I don’t know why anybody would. It’s not like there are people meticulously perusing everything I’ve searched. It’s just a couple algorithms calculating relevance based on my past preferences. You must have forgotten about Microsoft’s reputation already. They’re known for circumventing progress by proprietizing standards; Google supports open standards. Microsoft does wrong to get more money out of our reliance on its products; Google does “evil” because it wants to improve our overall experience. Even if you’re just trying to give Google some competition, I still don’t understand. Microsoft is worth several billion more than Google. As far as search is concerned Microsoft may still be the underdog, but big picture: Microsoft has a large enough share of the American economy. Also, I’d like to say that Google does great things with its personalization — even its ads are great. They’re the only advertisements I have clicked on since I was in middle school. Saurav, Vitamin B6, SEO Link Company – I’m glad to hear you’re giving Bing a try, just like me! And we’re not alone. Search market share statistics for November were just released, and Bing rose to more than 10% of U.S. searches for the first time. Woohoo! Geck0man – That’s an interesting point. I wonder what experience advertisers are having with Bing search ads. Because of targeting and personalization, I’ve read that often an advertiser has trouble running searches themselves to see their own ads in action. However, hopefully they can tell through analytics and conversion rates whether Bing is serving them up or not. If anyone has a case in point, feel free to share it. Thanks! I’m still new on Bing. In fact, I haven’t seen more of what it has to offer. But thanks for convincing your readers to try out on Bing. It looks like there are no ads on the Bing results page. As someone who works with the advertising side of search engines, this has been bothersome to me. It seems to be very inconsistent to me and I have heard different stories from different personnel at MSN. I’m with you, Andy. I find that Bing’s results are not as good as Google’s, though I’m also still learning. For instance, I wanted to run a blog search today, which Google would give me under the “More” link; I finally found it in Bing located as a left-hand option under their “News” vertical. I too am trying to use Bing more, however I still find Google to be a better search engine (I hope Bing continues to get better). I’m not happy with the way Google deals with personal privacy concerns. The internet is not “Google”… yet. Wow this is really a good analysis of both search engines Google and Bing.I like your experiments with these both search engines.You have described very well.I have never used Bing for search but after reading your post I will start to use it.Thank you very much..
Really enjoyed reading this article. I think I will start experimenting on Bing more often than usual after reading this blog.